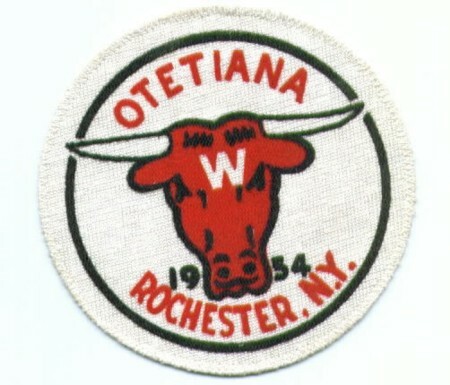 Mike Hinman sends along a whatsit from Otetiana Council, Rochester, New York. Can anyone help Mike in identifying this issue? The composition and material is reminiscent of the 1954 Area 2-E conclave patch. A Philmont contingent piece? 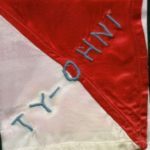 The wolf is the Ty-Ohni totem and their is no known 95 Chapter that used a bull. Can any Lodge #95 readers help Mike out? There are two patches and a neckerchief that use this same basic design. The other patch was for a Philmont contingent. I can scan them for you if you are interested. This logo was used by the long gone Western District of Otetiana Council.